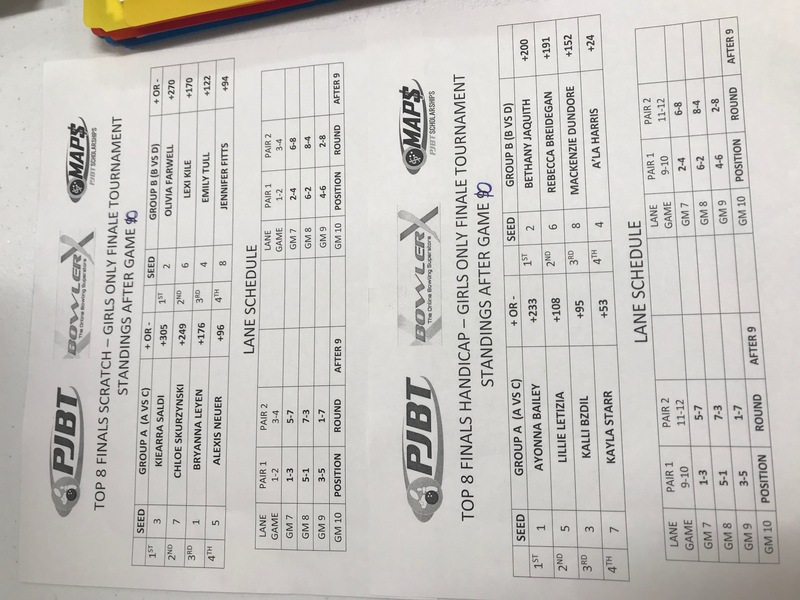 The PJBT concluded is 1st Girls Only Season with a Big Money Payout Finale Tournament. This event concluded our short season, with the third event of 3 on the season. This event has extra top prizes and an extended format. 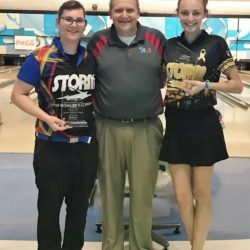 This event mimicked a mini-version of a PWBA Professional Women’s Bowling Event. Format was 6 games of qualifying and the top 8 in each division were divided into two groups. Group A (odds 1-3-5-7) and Group B (evens 2-4-6-8). They bowled 4 additional games of match play with bonus pins. In Match Play, they bowled each person in their group once with a final position round. The top 2 remaining bowlers in each Group had a livestream rolloff match to win their Group. Winners of each Group then bowled each other for the title. On this day, we had 34 females competing…including 16 in Scratch and 18 in Handicap. Pattern for competition was the Gateway Arch Pattern from Kegel. In Scratch, Olivia Farwell came away with the title and her 2nd win of 3 events on the season. Farwell started the day out strong with games of 209, 193, 191, 249, 235, and 267 during qualifying. She was at +144 and seeded 2nd entering the Group Round. She only trailed tournament leader Bryanna Leyen by 22 pins. She became the top seed of Group B. In Match Play, she went 3-1 and advanced to +270 and maintained her lead in Group B. This advanced her to the Livestream Group Final, in which she took on Lexi Kile. Farwell defeated Kile 224-216 to win the Group. This advanced Farwell to the title match to take on Group A winner Chloe Skurzynski. This final match was classic for many reasons! Up until this event….we had 2 women’s events this year. The first one was won by Chloe Skurzynski. The 2nd one was won by Olivia Farwell. It was only fitting that our two title winners were about to bowl off for the finale title. Farwell struck often and a lot!! She shot 279 in the title match to win over Skurzynski’s 200. Farwell’s win earned her a $500 scholarship and plaque for her Girls Only Finale Win. In Handicap, Rebecca Breidegan captured her first women’s only title. Breidegan entered the event with a 158 entering average and 37 pins handicap. She had scratch qualifying games of 154, 183, 208, 135, 151,and 166. After qualifying, Breidegan stood at +19 and was seeded 6th of 8 entering the Group Match Play Round. 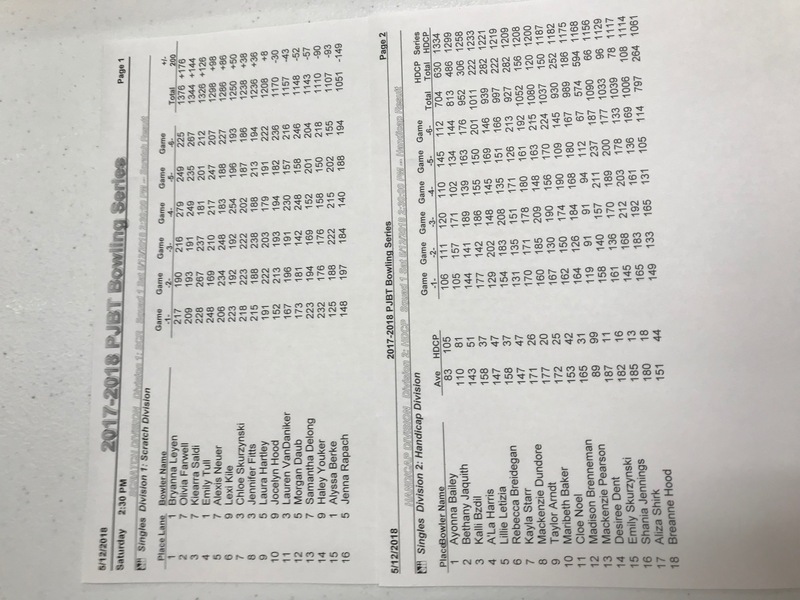 Breidegan did well enough in match play to propel herself from 3rd place in her group (Group B) to 2nd place and just 9 pins off the top spot. This earned her a spot in the Group B Final Match vs Bethany Jaquith. Their match came down to the final shot! In the end, Breidegan won over Jaquith 173-170. As the Group B champion….Breidegan advanced to the title match to take on Ayoanna Bailey….winner of Group A. In another close title match….Breidegan edged out Bailey 181-174 to win. Rebecca Breidegan won a $500 scholarship and plaque for her win. Thanks to all our females who bowled these events this year. They seemed to be a big success for the 1st year. We will be looking to expand our girls only schedule slightly next year! Stay Tuned!